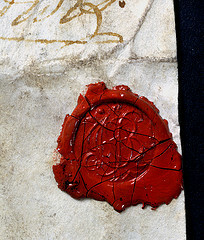 For no discernible reason this morning, I started writing about wax seals. I was writing about an eccentric teacher who uses them in a lesson one day. Where on earth did that come from, I thought. I find it truly odd how little ideas and thoughts seem to jump into your head like an overenthusiastic bunny rabbit whenever you’re casting about for where to go next with a story. It’s a mad kind of alchemy. I find it best to just go with it and trust in whatever little oddity springs to mind. If you think about where it comes from and where it’s going to fit in too much then you’ll probably just discard it but if you just carry on, it often finds a home somewhere.